To infuse Rs 50 crore in next three years. 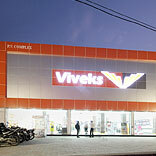 Viveks which began in 1965, today has a turnover of Rs 427 crore and significant presence in Tamil Nadu and Karnataka. With 46 stores at present, it is now on a fast track growth. It plans to invest Rs 50 crore in the next three years for further strengthening its footprint.